It's hard to believe, but there are other books scheduled for publication in April that are not in my closet. Here are the ones that I wanted to mention. David Baldacci - First Family - The First Lady enlists Sean King and Michelle Maxwell when a kidnapping at a children's birthday party at Camp David becomes a national security nightmare. Nevada Barr - Borderline - Anna Pigeon and her husband, Paul, take a trip to south Texas, but, even on vacation things happen around Anna, as the couple is sucked into intrigue after a grisly discovery. Elizabeth Berg - Home Safe - When a widow discovers her husband led a double life, her investigation leads to a new adventure. 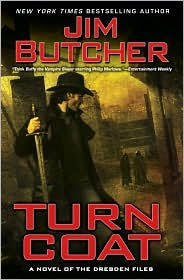 Jim Butcher - Turn Coat In the latest novel of the Dresden Files, the Warden Morgan has been accused of treason, and is on the run. Harry Dresden must keep Morgan hidden while trying to uncover a traitor. Mary Higgins Clark - Just Take My Heart - Emily O'Connor's life changed forever when a childhood friend ended up on life support, after an incident that was no accident. Now Emily's life is at risk, too. Diane Mott Davidson - Fatally Flaky - Goldy Schulz spent the summer working with the bride from hell, but now, the town's beloved doctor, and his best friend die, and Goldy wants answers. Iris Johansen - Deadlock - Emily Hudson devotes her life to rescuing artifacts and relics from war zones. When she and her team are trapped, the CIA calls on John Garrett to rescue them. Alexander McCall Smith - Tea Time for the Traditionally Built - The return of Mma Ramotswe, of the No. 1 Ladies' Detective Agency. James Patterson & Maxine Paetro - The 8th Confession - The hunt for two criminals tests the skills of the entire Women's Murder Club. Lisa Scottoline - Look Again - Journalist Ellen Gleeson can't stop thinking about the photo she received of a missing child, one who looks just like her adopted son. Stuart Woods - Loitering with Intent - Stone Barrington and his sidekick track the missing son of a wealthy man to Key West, but he may have a good reason for not wanting to be found. If you're a fiction reader, and you don't find something enticing in this list, or my treasures in the closet, you might not be in the mood for fiction. There's something here for everyone's taste. Happy Reading! I like David Baldacci's books as well. He's very nice. I met him in Richmond, VA. I didn't see that Sinclair Browning is coming to the Tucson Book Festival next week so I ordered "The Last Song Dogs" from Amazon (a previous recommendation of yours). (I know - I should have gone to the library. Would you believe it never occurred to me until just now! How weird!) Anyway, lots of good things in your closet and non-closet! Yvonne - I always feel more secure when I have plenty of books in the TBR pile, so that's OK that you're backed up. I like that! Something for everyone in the family. And, I'm a BIG Jim Butcher fan myself. It's a good looking batch of books! At least you're thinking of the library now! Maybe in the future, it will be your first thought for a book. I hope you like The Last Song Dogs! Lots of books for your TBR pile, I hope! Glad to see you mentioned Elizabeth Berg's book. Can't wait to read it. She is an absolutely wonderful writer - particularly appealing to women. She usually writes as she says about "ordinary life" so if this one has a mystery to it I know it will be great. Can't believe that people forget to go to their library. I couldn't afford my reading habit if I had to buy all of the books I love to read. Also I don't know if people know that they can put in a request that their library buys a book they don't have. My library is wonderful and usually buys whatever book I want and if they can't they will borrow it from another library in our state. Please write about this and make people more aware. You're right. I just hate to write about libraries buying books right now, with the budget crunches. My library took requests in the past, but, right now, with our current budget situation, we're not promising library patrons we will buy anything. In fact, I use my ARCs as prizes in contests, but, when I receive an actual hardcover, I donate it to the library after I read it. As a public librarian, I encourage everyone to use the library. I just know there are too many libraries in the same boat we are, and I don't want to encourage people right now to go ask libraries to buy books. They'll just be disappointed. Hi Lesa: Sorry to hear that your library and others are suffering. I guess we are fortunate here in Milford, Connecticut as I have not seen any signs of cut-backs yet. I also think that people should get more involved with their town budgets and voice their opinion so that they don't cut back on funds for the library. The library is the most wonderful place for free entertainment we have - books, magazines, and videos. Thanks for all you do to promote libraries and books. I totally agree with you. I wish people would get more involved in speaking up in support of libraries. We offer all of that free entertainment, and, now, with the bad economy, we are flooded with people who need our resources to apply for jobs, unenployment, and just use computers because they are no longer getting the Internet at home. Our circulation is soaring at a time when budgets are crashing. You are very fortunate in Milford. Thank you for your support of libraries! I just finished up Blood Rites, book six in Jim Butcher's Dresden Files series. That means I've got four more to read between now and April when Turn Coat appears. I highly recommend this series to fantasy fans; it's action-packed, humorous, and yet at times emotionally potent. Seth, in some ways I envy you that you still have all of those Dresden Files books to read before Turn Coat. They are wonderful books. And, you describe them perfectly. Thank you.